Kiel, Germany. – … how to start such a press-release ? 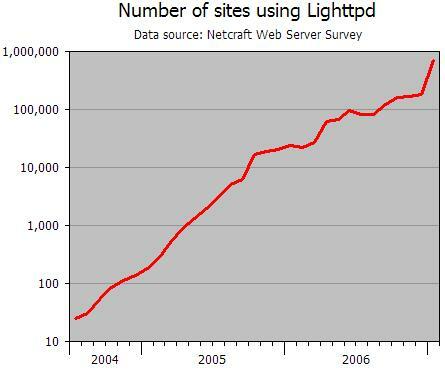 According to netcraft’s server-survey Feb’07 lighttpd is now on #6 and has now a market-share of 0.6%. This is more then 700,000 domains which are handled by lighttpd. Last month we were at #12 with 170,000 domains. Even if I don’t trust this impressive raise I’m none-the-less impressed by it. What comes next ? If we really make it into the top5 for a longer time I will need someone who knows how to write a press-release.